Picked up my finished suit today. 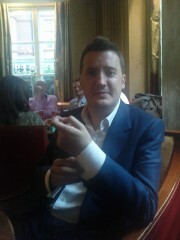 First picture of my in my finished suit, in Claridge's Bar. Back at home later on. I have often observed this "I'm adjusting my cuffs" pose in pictures of other chaps wearing suits. 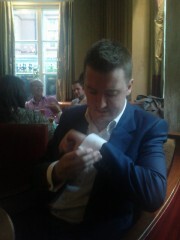 Here I'm not adjusting my cuffs, instead I have my hands in my pockets. I thought it might be interesting to involve a tennis ball. Here it is up in the air. Incidentally it is a Veuve Clicquot tennis ball, that came free with a bottl of Champagne. If the first one was Gilbert then I suppose this is George. I'm very concerned about my new suit becoming creased. I feel irons should have more than one function. I bet you didn't expect a Satsuma vase next.